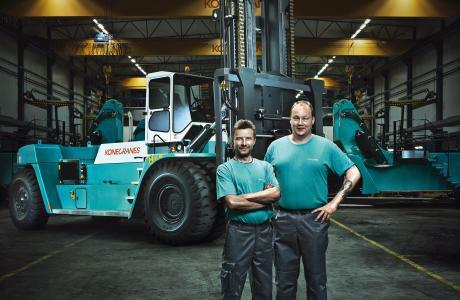 Konecranes – which develops, manufactures and sells large fork-lift trucks, container handlers and so-called reach stackers – has been collaborating with us for more than 20 years on development and production of electrical systems. The company is a world-leading supplier of lifting equipment for engineering and process industries, shipyards, ports and terminals. Whatever your lifting requirements, they undertake to supply lifting equipment and services that boost the productivity and value of your company. 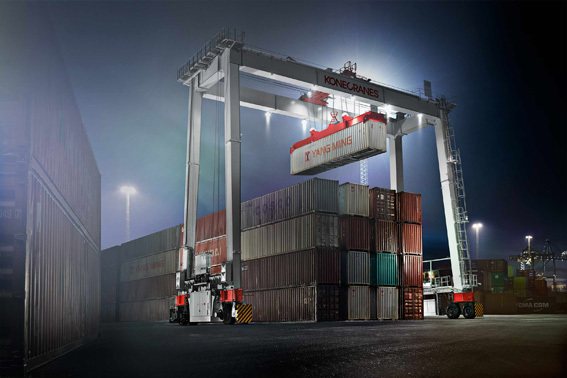 – Konecranes recently rolled out their new reach stacker with hybrid technology. Superior overall economy and environmentally friendly operation makes the HLT a popular choice among customers. – Our test drivers say the HLT is their favorite!, says Timothy Arnesson at Konecranes. HLT is a so-called reach stacker used for lifting containers. The machine is equipped with a diesel-electric hybrid drive train, an electrified hydraulic lifting system and electric energy storage. – Konecranes is known to be cutting edge of technology. It is important for us to be able to offer customers an alternative that is both economically and environmentally sustainable, says Timothy Arnesson, Machine Safety Engineer at Konecranes. The reach stacker with hybrid drive shows a reduction in fuel consumption of between 30 and 50 per cent during the normal handling of fully loaded containers, compared with conventional reach stackers. The total cost is very competitive. Pay-off time is only two years or 10,000 hours. Common learning Development has taken place in close cooperation with Rimaster Development. – We’ve had overall responsibility for the development of the electrical system. Since it’s a question of hybrid technology, the challenge has been to combine the machine’s three different systems – design of the base machine, high voltage for operation and the lifting system itself, explains Fredrik Larsson, Senior Design Engineer at Rimaster Development. – Rimaster has a long history as a system supplier and partner of Konecranes – but this was a completely new experience for those involved, says Timothy. It has been a challenging journey where we have learned things together. We have been a well-composed team of engineers in various disciplines who have collaborated very closely. It’s important for us to have a responsive partner and that dialog is straight and simple – especially in an advanced project like this. While working with HLT, Rimaster and Konecranes also took the chance to further develop their forms of collaboration. Rimaster’s engineers have this time worked directly in Konecranes’ 3D model and done modeling of the cable harnesses in Creo. – It’s a lot of cabling and many new components to fit in. In this way, we were able to optimize the design from the start instead of trying to fit it into a finished machine,” says Fredrik and is backed up by Timothy. 3D modeling of high voltage cabling was really neat. Working in this way eliminates uncertainty later in the project. This is a way of working that we want to develop further so as to also include hydraulics. Operating the finished, series manufactured reach stacker in its right environment is a high point after four years of development. And Timothy is very pleased with the outcome. – I think it has a distinct response and is quite alert!